Heavy to isolated heavy rain is expected in upper Thailand through to Tuesday, while strong wind waves are forecast in the South over the same period, the weather office warned on Friday. The Meteorological Department said the low pressure area over the Gulf of Tonkin was expected to bring isolated heavy rain in the North and the Northeast between July 27 and 31. The moderate southwest monsoon will be stronger with isolated heavy rain in the South, Central and the East. Wind waves of 2-4 metres are expected in the Andaman Sea and 2-3 metres in the upper Gulf of Thailand. All ships are warned to proceed with caution, while small boats should remain shore during this period. People living along the coast of the western South and in the East should be alert for strong winds. The department urged people to keep abreast of weather forecasts around the clock. Disaster Prevention and Mitigation Department director-general Chayapol Thitisak said on Friday provincial disaster prevention offices had been put on full alert for heavy rain and told to warn local residents to prepare for possible dangers from heavy rain and strong wind waves. The influence of former tropical storm Son-Tinh resulted in flash floods and landslides in 20 provinces between July 17 and 26 that affected 11,160 people from 4,198 households in 32 districts, Mr Chayapol said. The situation had eased in 19 provinces. Only areas of Kanchanaburi remained floode d, particularly in Sangkha Buri district, he said. In this western province, 2,938 people from 1,130 households were affected. Four temples, two roads and seven government offices were inundated. More than 300 rai of agricultural land was damaged. 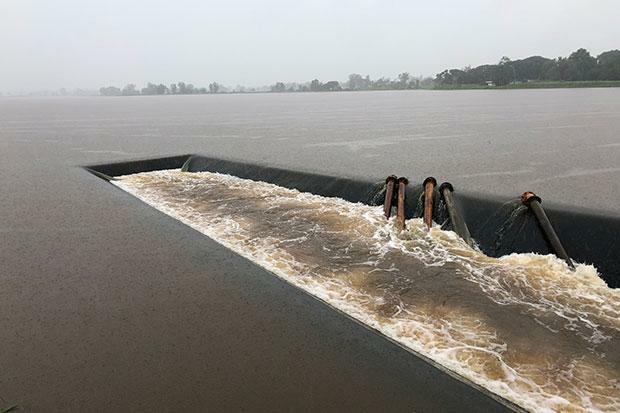 In Kalasin, water levels at 18 medium-size reservoirs in the northeastern province continue to rise due to continuing heavy downpours and four of them were already at maximum capacity. Kalasin governor Kaisorn Kongchalard said on Friday that areas near the four reservoirs -- Huay Pho, Huay Kaeng, Huay Fa and Lam Payang Bon -- were under extra watch as they might overflow. Provincial authorities have warned people living near the four reservoirs to brace for flooding. A disaster warning centre has been set up to deal with possible flash floods, Mr Kaisorn said.